Creating attractive documents that contain text, mathematics, and graphics is seamless and easy with Scientific Notebook Version 6. Although simple to use, Scientific Notebook 6 is a powerful mathematical word processing system that facilitates teaching, learning, exploring, and communicating mathematics. Scientific Notebook 6 gives you a choice of operating systems: Windowsor OS X. With its entirely new Mozilla-based architecture, Scientific Notebook 6 provides more flexibility: you can save or export your documents in multiple formats according to your portability needs. Scientific Notebook 6 automatically saves your documents as XML files. The embedded MuPAD 5 computer algebra engine allows the user to perform computations on the screen, and to print them out correctly formatted. There is no complex syntax to master to be able to evaluate, simplify, solve, or plot mathematical expressions. You can compute symbolically or numerically, integrate, differentiate, and solve algebraic and differential equations. With menu commands, you can compute with over 150 units of physical measure. With Scientific Notebook 6 you can create two-dimensional and three-dimensional plots in many styles and coordinate systems, and enhance the plots with background color, grid lines, and plot labels in specified locations and orientations. You can animate these kinds of plots: 2D plots in polar coordinates; 2D and 3D plots in rectangular coordinates; 2D and 3D implicit plots; 2D and 3D vector fields; 3D tube plots; 3D plots in cylindrical coordinates; and 3D plots in spherical coordinates and vector fields. Plots can be viewed on screen with playback toolbar controls. Use your mouse to start, stop, re-run, and loop animations. You can define an animation variable t for your plot and specify the animation start and end times and the rate of frames per second. With OpenGL 3D graphics, you can rotate, move, zoom in and out, and fly through 3D plots. 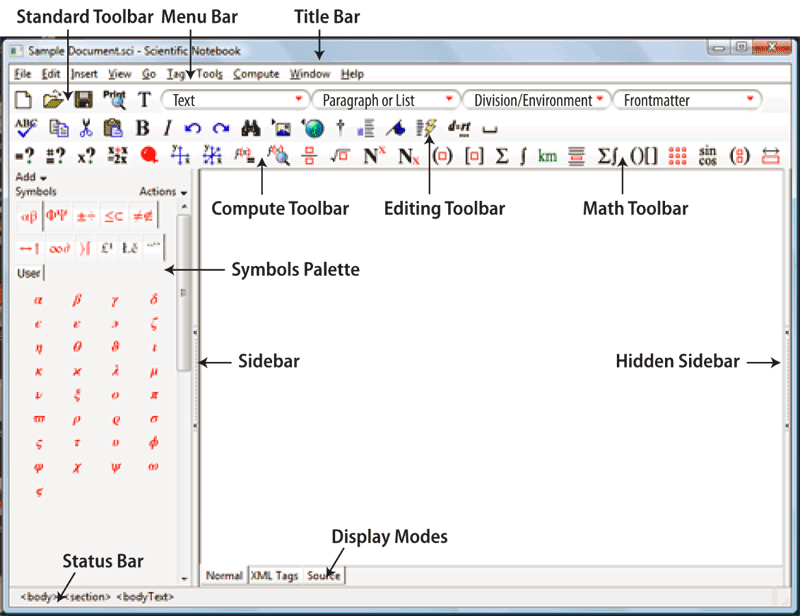 Scientific Notebook 6 has an updated program window with streamlined layouts for the toolbars and symbol panels. Most tools work the same way they did in earlier versions. A mouse-activated tooltip gives the name of each toolbar button and symbol. Documents and all files related to them are automatically bundled together. In Scientific Notebook 6 you only need a single file bearing the extension .sci to share a document. In XML and Xhtml files, Version 6 represents your mathematics as MathML. This makes it easy to create xhtml web files for the representation of your mathematics on various platforms over the Internet with a browser. For Version 6 the recommended viewer is Firefox. An important new feature of Scientific Notebook 6 is that you may Undo an unlimited number of previous editing changes from your current session within a document. The ability to check your spelling in realtime is new. With the inline spell checking from MySpell, you can catch any misspellings. MySpell, which is open-source, includes dictionaries in over 40 languages. Misspelled words have a wavy red underline. A new visual interface is used to create tables to the exact dimensions you need. Being able to leave dialog boxes open while you make replacements and corrections saves time. Scientific Notebook 6 supports any left-to-right or right-to-left language that is supported by your operating system. Scientific Notebook 6 has great potential when used in an educational setting. It provides a ready laboratory where students can experiment with mathematics to develop new insights and to solve interesting problems. Scientific Notebook 6 makes it easy for students to produce clear, well-written homework. In a classroom equipped with appropriate projection equipment, the program’s ease of use and its combination of a free-form scientific word processor and computational package make it a natural replacement for the chalkboard. You do not have to erase as you go along, so previous work can be recalled. Class notes can be edited and made available for viewing online or printed. The manual, Doing Mathematics with Scientific WorkPlace and Scientific Notebook Version 6 by Darel W. Hardy and Carol L. Walker, describes the use of the underlying computer algebra system for doing mathematical calculations. Exercises are provided to encourage users to practice the mathematical ideas presented. This manual is available as a download, but can also be purchased in paperback form. Scientific Notebook 6 is the ideal tool for distance learning. You can send mathematical documents containing text, equations, and plots over the Internet; you can open the file at any URL address from inside the software. It is easy to build an entire website with mathematical content which can be read with any web browser that displays MathML, such as Firefox. Note the recommended browser for Version 6 is Firefox, not Scientific Viewer. Scientific Notebook 6 does not produce typeset output, but can use documents created in Scientific WorkPlace and Scientific Word. The addition of cross platform capability in Version 6 provides more flexibility for sharing your work. ** With proper documentation - email documentatin to sales@specialneedscomputers.ca. Download will be emailed to you.